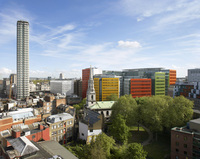 Legal & General Property and Mitsubishi Estate Company today launched Central Saint Giles, the first completed development in the UK by internationally-acclaimed architect Renzo Piano. The striking landmark building clad with 134,000 ceramic tiles in bold shades of yellow, orange, green and red is an exemplar of mixed-use sustainable office-led development. It consists of 400,000 ft² of office space, 56 private apartments 53 affordable homes and nine new restaurants and café bars around a new courtyard piazza, replete with two mature oak trees and modern art installations by Rebecca Warren and Steven Gontarski. Located in the St Giles area of London's West End between Covent Garden and Soho the development was described by Paul Finch, the chairman of the Commission for Architecture and the Built Environment (CABE), as one of "London's great commercial buildings" which sets "the standards by which office architecture should be judged." The launch comes at an opportune time as West End office demand is improving at a time when there is limited supply of large prime office space. The partnership expects to make further announcements on tenants for the office space over the next couple of months. Irish restaurateur and judge on the BBC's Great British Menu Oliver Peyton is opening a Peyton & Byrne café bakery on site. Also set for the scheme is breezy Bincho with its modern casual Japanese tapas twist, of grilled skewers, FishWorks the seafood restaurant group founded by Mitchell Tonks, Turkish favourite Huseyin Ozer's Sofra and popular Italian chain Zizzi. Negotiations are progressing on all the remaining units. The development has impeccable green credentials having achieved a BREEAM "Excellent" rating for its offices. This is an impressive achievement as the office element boasts some of the largest floorplates (43,000 sq ft) in London's West End. Biomass boilers will provide 80% of the heating and hot water for the offices and apartments, while 60% of rainwater and 100% of cooling tower discharge will be re-used for irrigation and for flushing toilets. Green roof terraces designed by Chelsea Flower Show Gold medallist Charles Funke will soak up rainfall and contribute to biodiversity in the highly built-up area. Legal & General Property development director Simon Wilkes said: "Today marks a very significant milestone for the Central Saint Giles Partnership. It has been a great privilege to be work with Renzo Piano, an architect of such ability. The entire design and construction team led by Stanhope and Bovis Lend Lease has done an outstanding job to turn his vision into reality. The end result is one of the best places to work in London. "We would not be here today if it was not for the solid support of the local community who ensured that the scheme was granted planning consent, and have worked with us through the entire development cycle. Central Saint Giles is not just about great architecture, it is about accessibility and vibrancy and creating a reinvigorated sense of place. One of our proudest achievements is that well before the development was completed it was clear that Central Saint Giles was having such a positive impact on the renaissance of the St Giles area." Mitsubishi Estate Company UK managing director Masami Amano said: "Mitsubishi Estate has a long term commitment to property development in the UK. This is the first time we have worked in a joint venture with a UK company and we are very pleased with what has been achieved. Working with Legal & General has been a very enjoyable and successful partnership. "We share Legal & General's esteem for Renzo Piano, who is a brilliant architect. We must also pay tribute to the development team led by Stanhope which is one of the best we have worked with. Like our Paternoster scheme in the City, we are proud not only to have been involved in building great architecture, but in also creating a strong sense of place which can be enjoyed by all."